This article was written in March 2015, but not published until June. 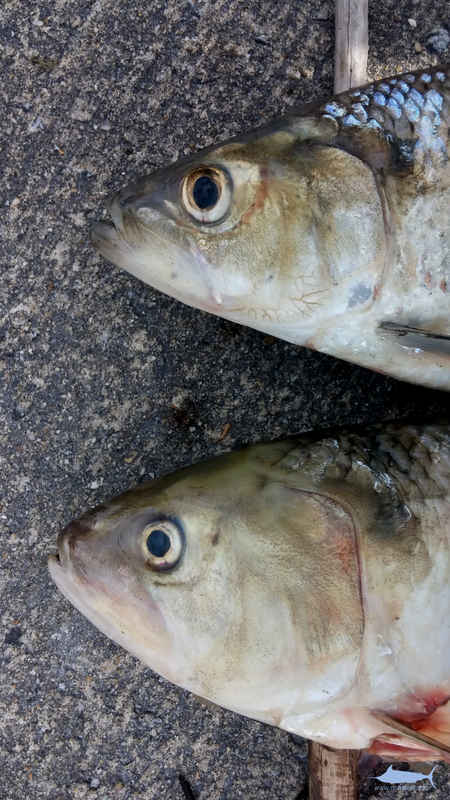 In North Carolina, members of the family Clupeidae include the herrings, shad, and menhaden. Although members of this family can be found year round, we wanted to specifically mention them today due to the annual spring spawning runs that a few of these species make. 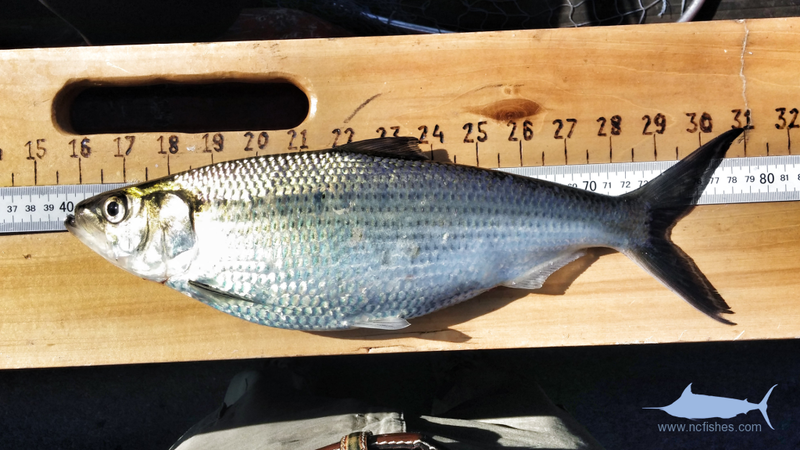 Starting in about February, and running through May, the sexually mature (and normally marine) Hickory Shad, American Shad, Blueback Herring, and Alewife Herring will enter area rivers and swim up them to reach their spawning grounds. It is during this time that anglers will commonly encounter them, and with any luck, catch them. 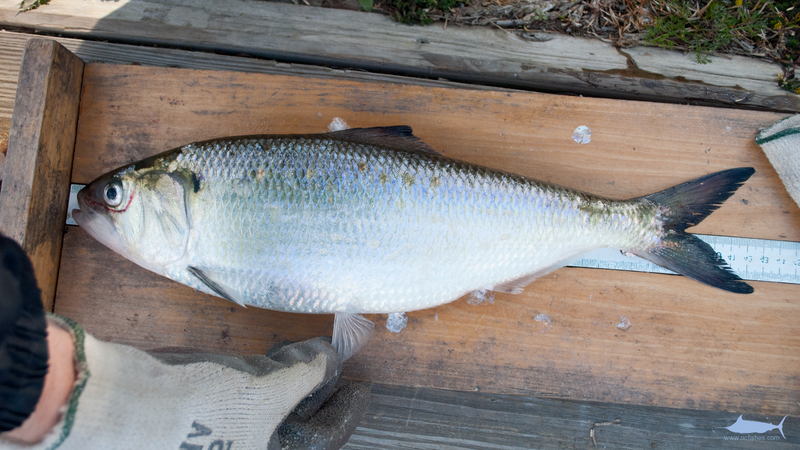 The American Shad, Alosa sapidissima, is the largest of all the herrings. Commonly reaching sizes of 50 cm SL (19.6 inches, Standard Length). Like all shad in this article, they have a silvery, metallic sheen, with blues and greens on top, fading to white below. They also have a row of scales on their bellies, known as ventral scutes. These scales are saw-like, very noticeable, and serve as a method to distinguish the river herring and shads from the sea herrings, which lack these scales. One of the most obvious features to aid in identifying them, is the lower jaw. The lower jaw of the American Shad does not protrude beyond the upper jaw when fully closed. This will become a lot more obvious in the following sections. The American Shad has 59-73 gill rakers on the lower limb of the first gill arch. 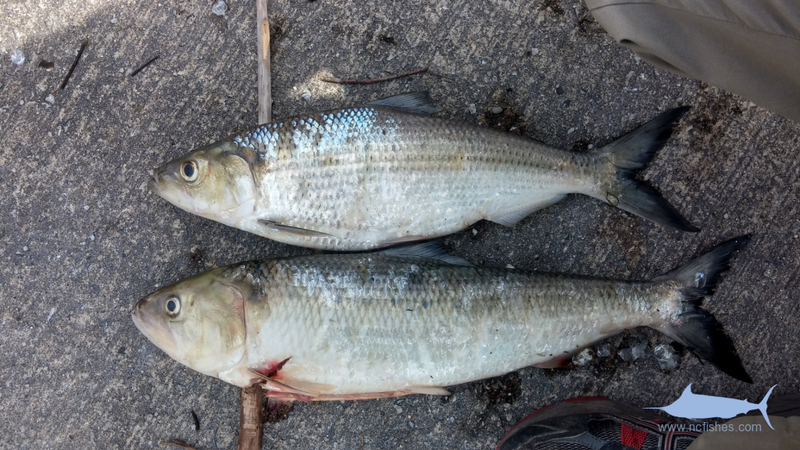 Hickory Shad are noticeably smaller on average than the American Shad. Commonly to 40 cm SL (15.7 Inches Standard Length). Hickory Shad also have ventral scutes as in the above photograph. 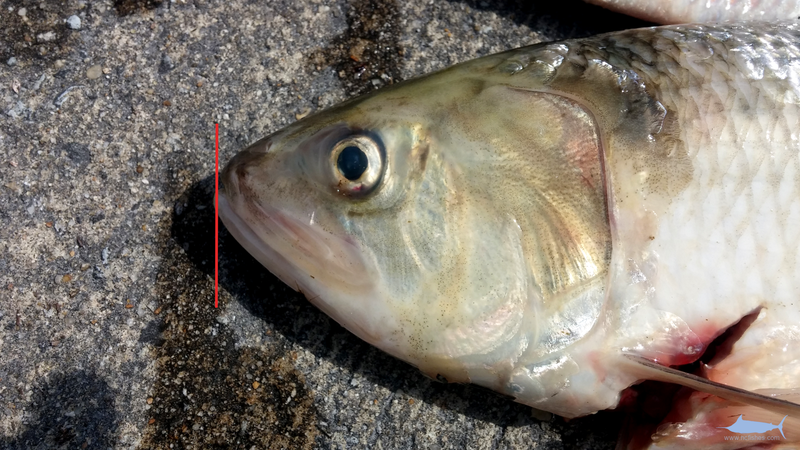 The lower jaw of the Hickory Shad protrudes beyond the upper jaw when fully closed. 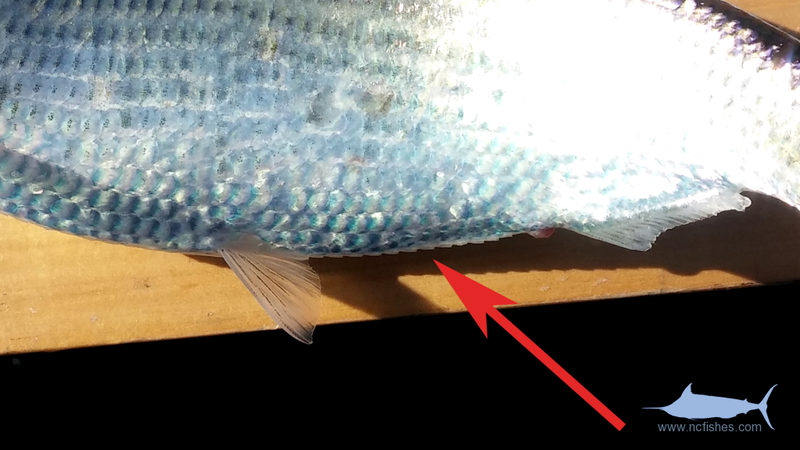 The Hickory Shad has approximately 20 gill rakers on the lower limb of the first gill arch. 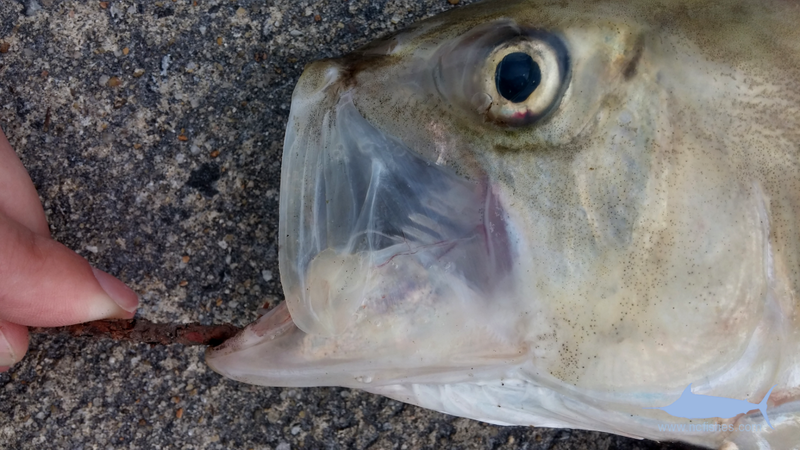 Here, in this photo above, you can see the lower jaw of the Hickory Shad protrudes a great deal past the upper jaw when the mouth is closed. 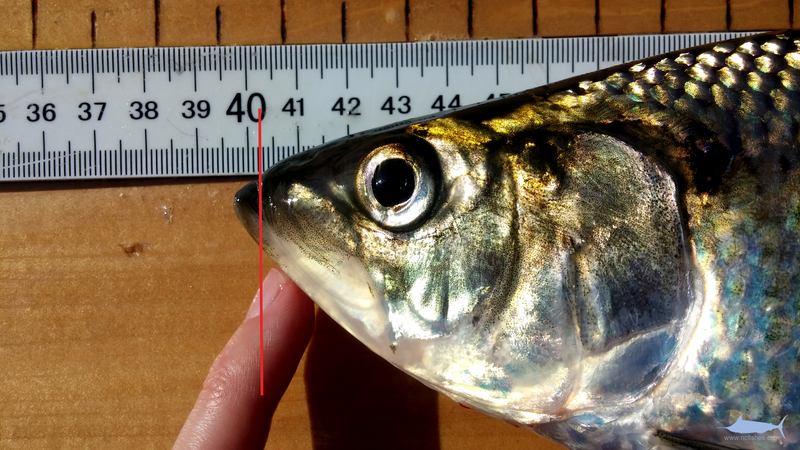 Here, in the photo above, you can see the lower jaw of the American Shad does not protrude beyond the upper jaw when the mouth is fully closed. The mouth is in fact open just a bit in this photograph. Some of the other more common Clupeids in our area include the Gizzard Shad, Dorosoma cepedianum, the Atlantic Menhaden, Brevoortia tyrannus, the Atlantic Thread Herring, Opisthonema oglinum, and the Threadfin Shad, Dorosoma petenense. We will be adding additional photographs as we encounter them! Shad Identification by Fishes of North Carolina is licensed under a Creative Commons Attribution-NonCommercial-ShareAlike 4.0 International License.